Effective today, the Rome Smokefree Air Ordinance will go into effect and expands the Georgia Smokefree Air Act to prohibit smoking in the Broad Street District. Areas that are exempt from the smoking ordinance and where smoking is permitted include: Private residences (unless used as a childcare, adult day care or health care facility); designated smoking hotel and motel rooms; existing retail tobacco and vaping stores; 18-and-over bars and restaurants; and designated smoking areas by employers that meet the requirements. 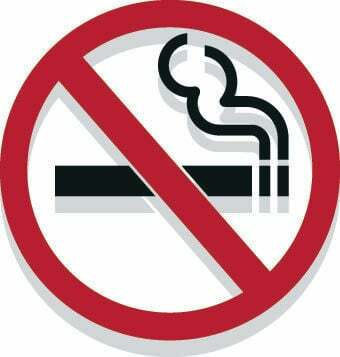 All businesses and public places in the specified prohibited smoking areas are required to clearly post a minimum of one “No Smoking” sign, which can be the international “No Smoking” symbol. Violations of the Rome Smokefree Air Ordinance can be reported by notifying the business owner. Violations can also be reported to the city manager’s office at 706-236-4400 or the Rome City Police by dialing 911. A person who smokes/vapes in an area where smoking is prohibited can be fined $50-$250. A business that permits smoking can be fined $100-$500. The city may also suspend or revoke permits or licenses issued to businesses that are habitual violators of the ordinance.